Crispy roast potatoes remind me of that casual yet sophisticatedly dressed man you get a quick glimpse of in a busy subway car during rush hour. There is method and madness behind his sartorial elegance. Despite the rolled jeans, unshaven face, and messy hair, his carefully chosen outfit just works for him. Even the shoes. These crispy roasted potatoes are like him. Perfectly made roast potatoes are unparalleled. They are beautifully bronzed, as if they’d been on a beach-side vacation. And most importantly, they’re crisp-coated and fluffy-bellied. 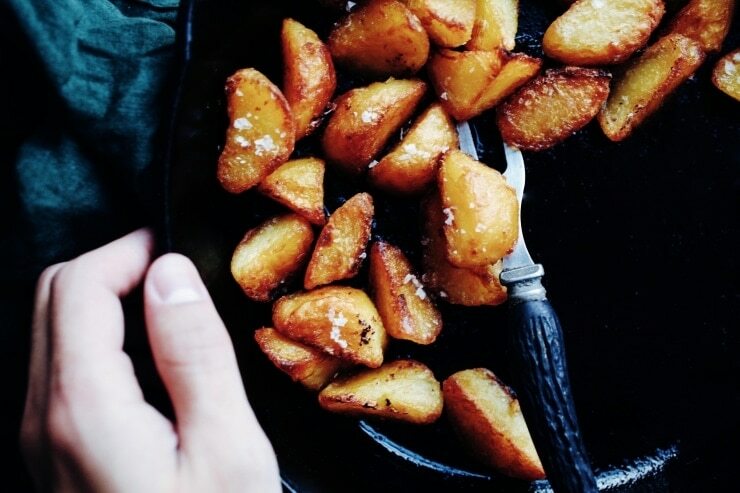 When it comes to crispy roasted potatoes, needs must be met. They must satisfy a hankering for thick (and crispy!) deeply golden wedges that conjure memories of autumn and winter roasts, and plates smudged with ketchup. I recently received a subscription box in the mail from Hamptons Lane, containing an assortment of local artisan ingredients, tools, and serveware that enhance any food lover’s culinary horizons. Included in the Hamptons Lane New American box was a jar of incredibly gorgeous cage free duck fat from Epic Provisions– it was a no-brainer for me to use this to make roasted potatoes. 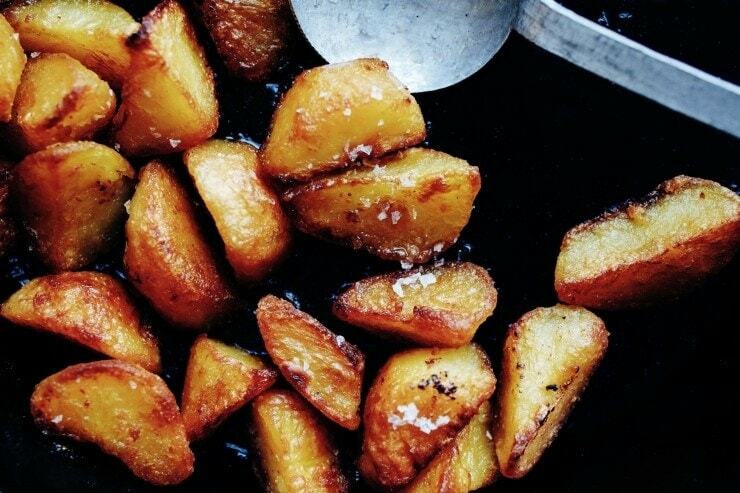 My crispy roast potatoes recipe is an indispensable starting point. The method is quite basic, and you can flavor them as you’d like. It all starts off with a bit of fat, which is heated in a roasting pan in a preheating oven until it’s searing. I’ve used duck fat here, but I most often make it with sunflower oil or olive oil. 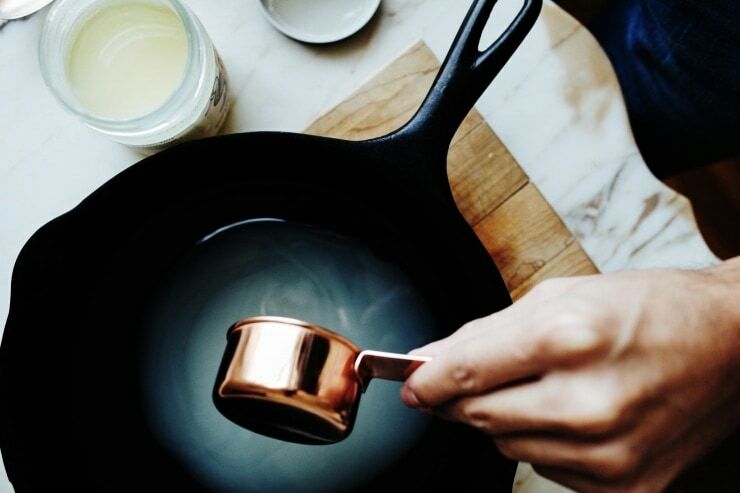 Whether you’re using duck fat or goose fat, or simply a cooking oil with a high smoke point is up to you. Safflower, sunflower, grapeseed, peanut, canola, or olive oil– they should all work well here. Just avoid extra-virgin olive oil, which is best left for dressing salads. Now I know, not everyone is accustomed to cooking with duck fat. It’s definitely an indulgent (and admittedly bourgeois ingredient), to say the least, and perfect for a holiday roast. Duck fat, like goose fat or chicken fat, is an ingredient that transforms anything it touches– especially potatoes–into a gilded masterpiece. Duck fat provides unbeatable richness and savory flavor that can’t be recreated by butter or oil, or a combination thereof. It can be used to make the flakiest biscuits, the most incredible pie or tart dough, a fantastic fried egg, the most luxurious grilled cheese sandwich, and in this case– the most crispy roast potatoes you will ever have. Heating up the duck fat whilst the oven is preheating allows for searing temperatures that will immediately crisp up the exterior of each potato as soon as it hits the pan. 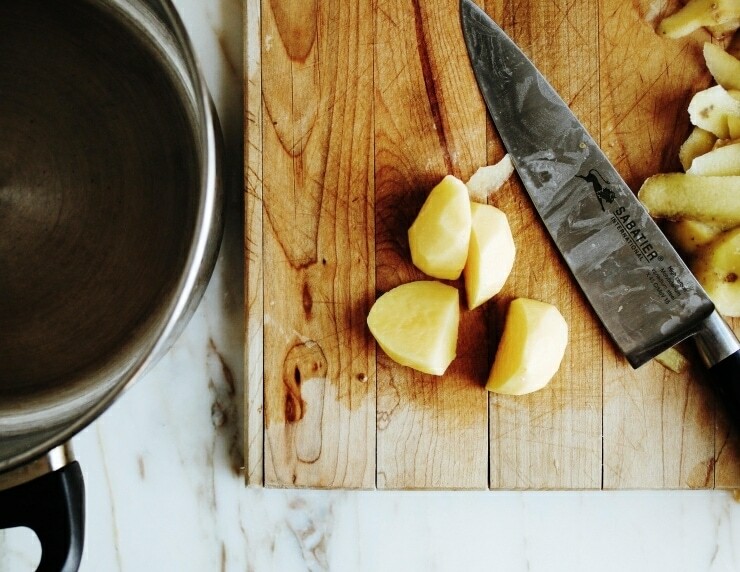 This is one of the crucial steps in creating unparalleled crispy roast potatoes. 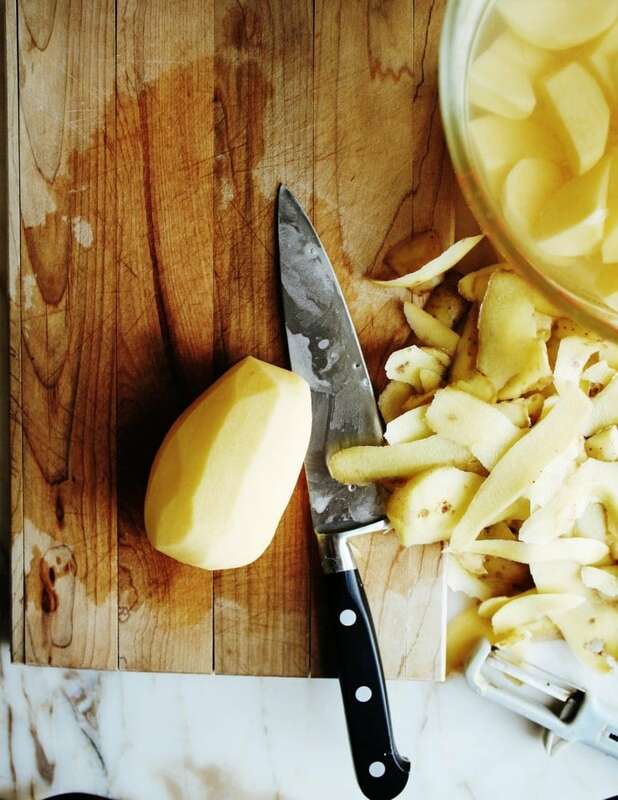 While the fat is heating up, large potato wedges are put in some hot water with some salt, and allowed to boil for exactly five minutes (you’ll want to set your timer). Boiling the potatoes allows them to have unbelievably fluffy interiors after they’ve had their time in the oven. 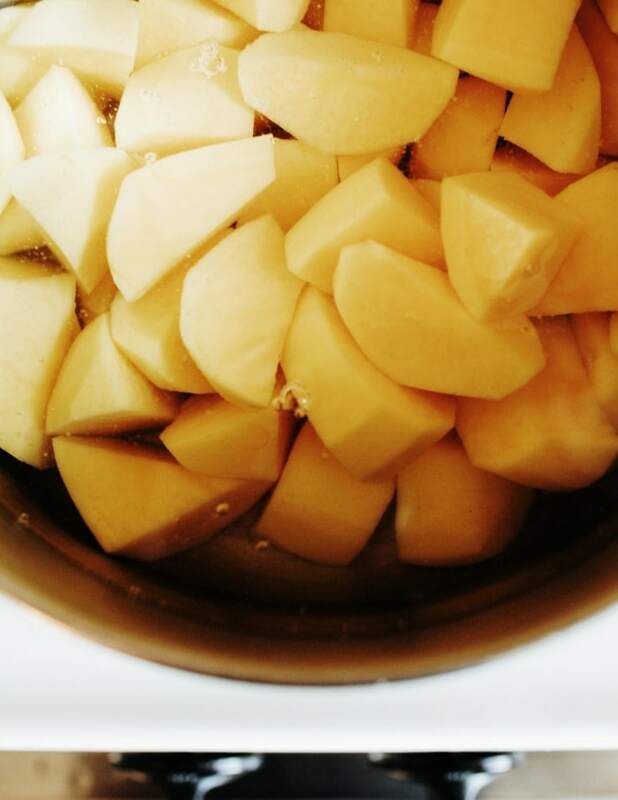 Once they’ve been boiled, the potatoes are strained of any water and shaken about until their sharply cut edges are frilled. The frilled edges and bits of pulverized potato are what turn into a crisp coat on the potatoes once they’re out of the oven. The frilled potatoes are then dredged in a little bit of flour. This is where you can go ahead and season the flour with a bit of salt and pepper or use your favorite spice combination, or completely hold off until they’re out of the oven… Whatever floats your boat. 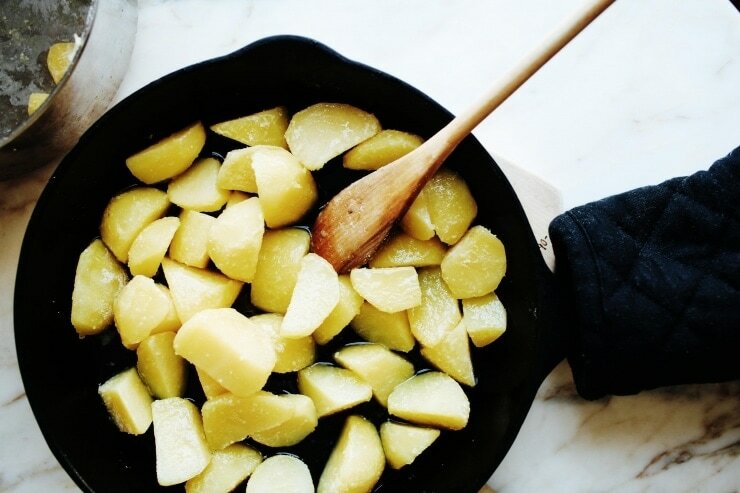 After the potatoes are dredged– this is where a bit of precaution should be taken– the pan of hot duck fat is removed from the oven and the potatoes are carefully tossed around in the liquid gold. The bubbling duck fat will hiss the moment the coated potatoes hit the pan, and they’ll get a bit of color; it’s a gloriously magical moment, but there’s more magic to come. The pan is placed back into the hot oven. A couple times into roasting, the potatoes are casually tossed about, and they’re left to crisp until deeply golden– almost like toast that’s been left a couple seconds too long in the toaster. Out of the oven, the roasted potatoes should be crisp and crackly on the outside, some with deeply caramelized edges, and the inside of each potato will be fluffy. All of these traits are the markings of fantastically crispy roast potatoes– one of mankind’s greatest creations, if you ask me. 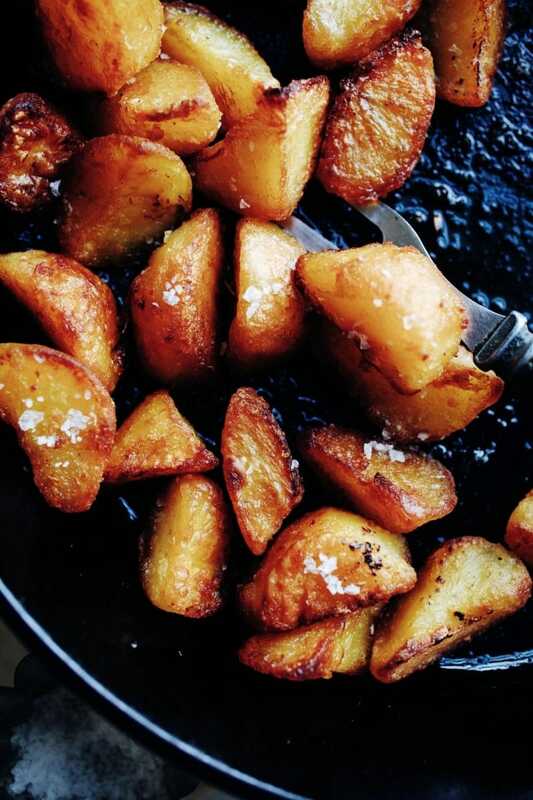 The secret to crispy roasted potatoes is good potatoes, plenty of hot fat, and a bit of love. 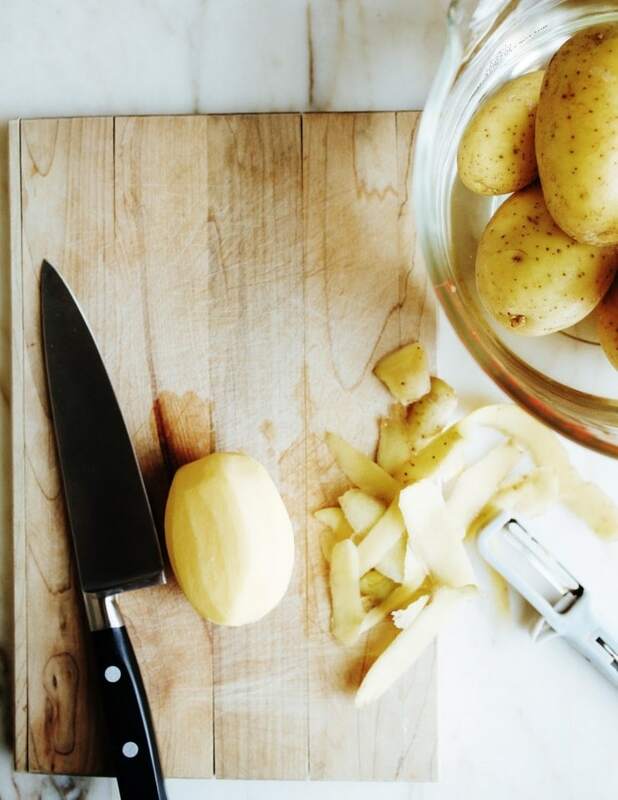 Despite the very few ingredients called for in this recipe– this recipe does need some loving in terms of setting a timer the moment the water begins to boil for the potatoes, and tossing the potatoes a couple times when they’re in the oven. I’ve used duck fat here– it adds a nice savory and indulgent flavor that oil can’t recreate, but feel free to use any oil you’d normally use for roasting vegetables. Goose, chicken, or turkey fat would work wonderfully here too. I like to use Yukon Gold potatoes here (English friends, I’ve provided alternatives in the recipe)– they make for nice fluffy insides and crispy outsides, but for even crispier potatoes, stick with good ol’ Russet potatoes. If you want more flavor, aside from just salt and pepper, add your favorite seasoning combination to the flour before dredging the potatoes– I find this works best. 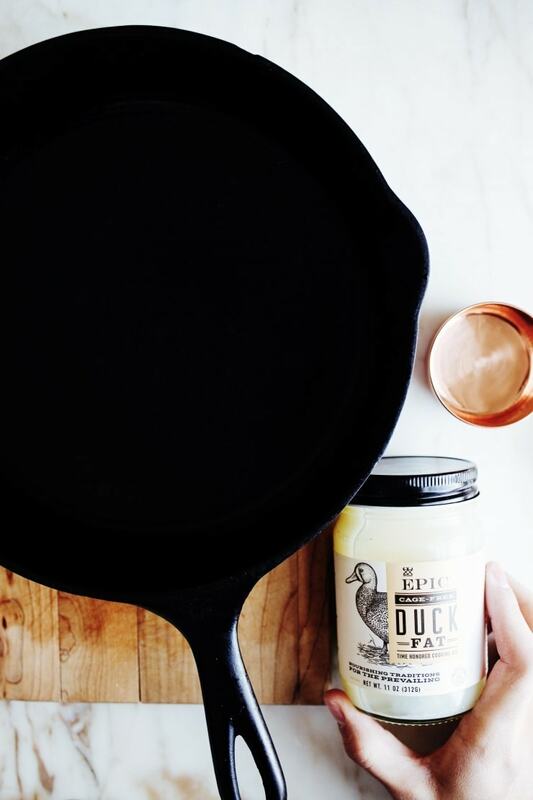 Pour the duck fat into a large roasting pan or large cast-iron skillet (one that allows for all of the potatoes to sit in a single layer). Place the pan in the middle rack of the oven, and preheat the oven to 425F / 210C. 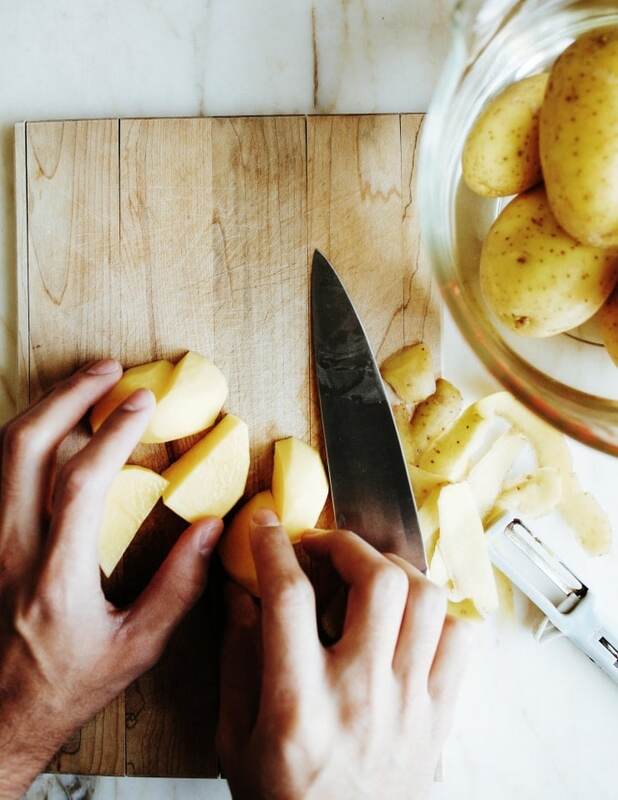 While the oven is preheating, peel the potatoes and cut them into large wedges (about 4 pieces if they’re medium-sized, and 3 pieces if they’re small). 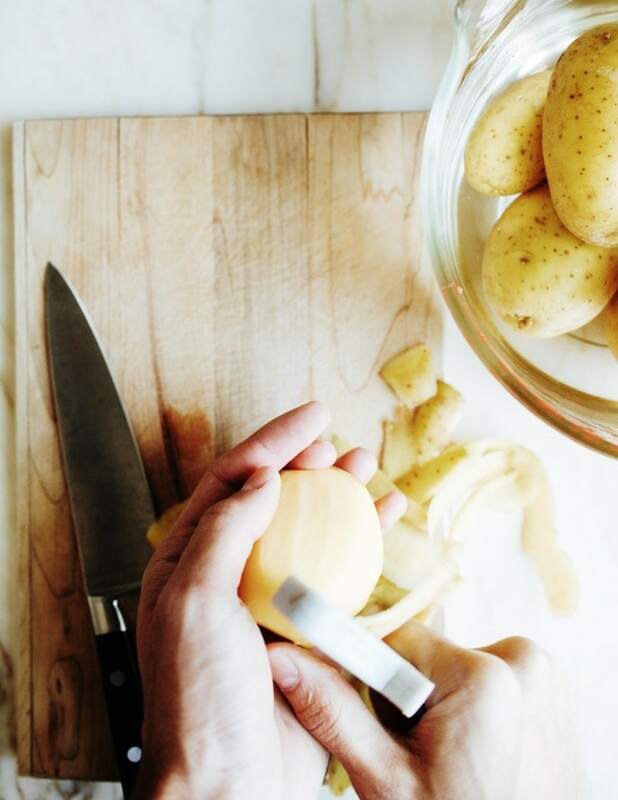 Place the potatoes in a large saucepan (preferably one that has a lid), and fill with enough hot water to barely cover them. Add a few healthy pinches of salt, and wait for the water to boil. 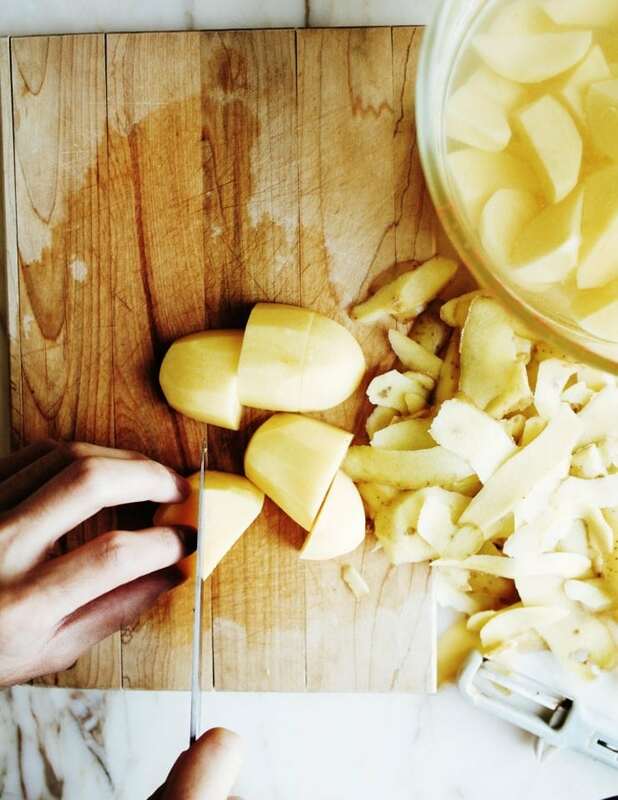 Once the water starts boiling, allow the potatoes to boil, uncovered for exactly 5 minutes. 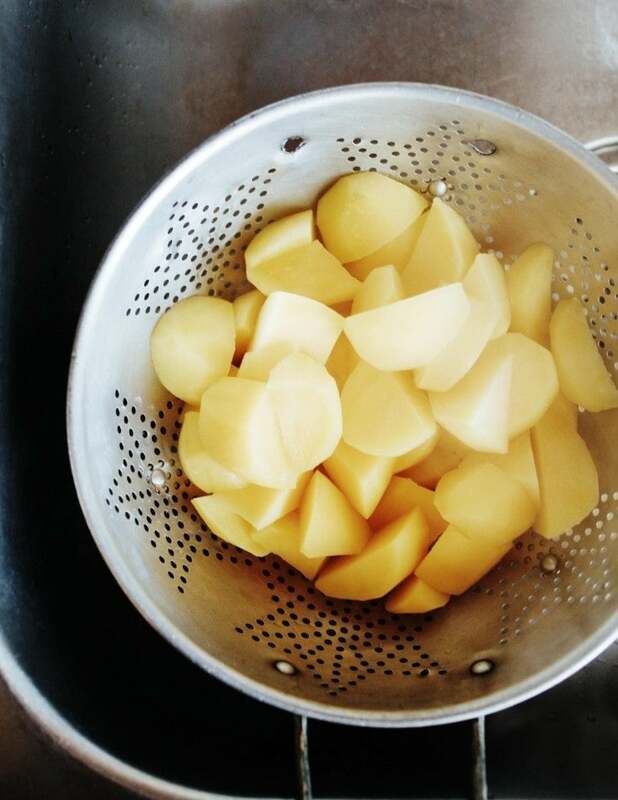 Once 5 minutes is up, drain the potatoes in a colander, and place back in the saucepan. Place the lid on the saucepan, and rattle the pan for a couple seconds. 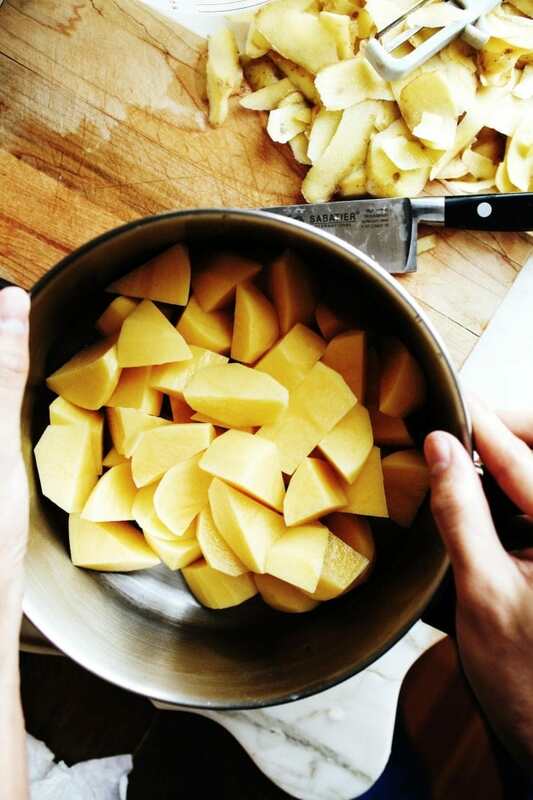 If you haven’t a lid for the pan, shake the pan from side-to-side until you see that the edges of the potatoes are frilled. After the potatoes have been roughed-up, sprinkle the flour over the top of the potatoes, and stir to evenly coat the potatoes in the flour. 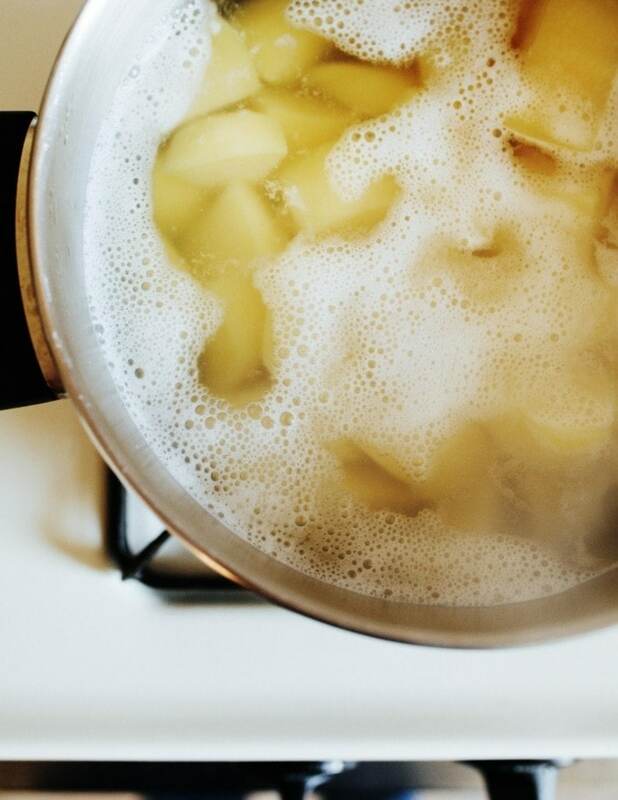 Now, carefully remove the hot pan from the oven and place the potatoes inside the hot duck fat (or oil).The fat will hiss and the potatoes will immediately get a tiny bit of color. 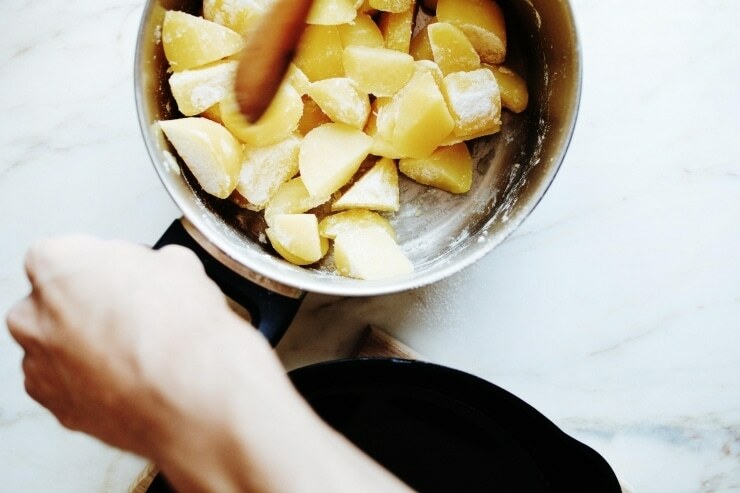 Turn the potatoes in the hot fat, and place the pan into the hot oven. Roast the potatoes in the oven for 15 minutes, then remove them from the oven and casually toss them with a spatula. Return the potatoes to the oven for another 15 minutes, and toss them again. After this, return the potatoes to the oven for another 15- 20 minutes until they’re deeply bronzed around the edges and audibly crispy on the outside. Season with sea salt and a bit of pepper, and serve right away, allowing any excess fat to drip off the potatoes back into the pan. This post was created in partnership with Hamptons Lane. All opinions expressed in this post are my own. Hamptons Lane provides the food lover with the tools they need to enhance their culinary experience as chef, entertainer, and eater. 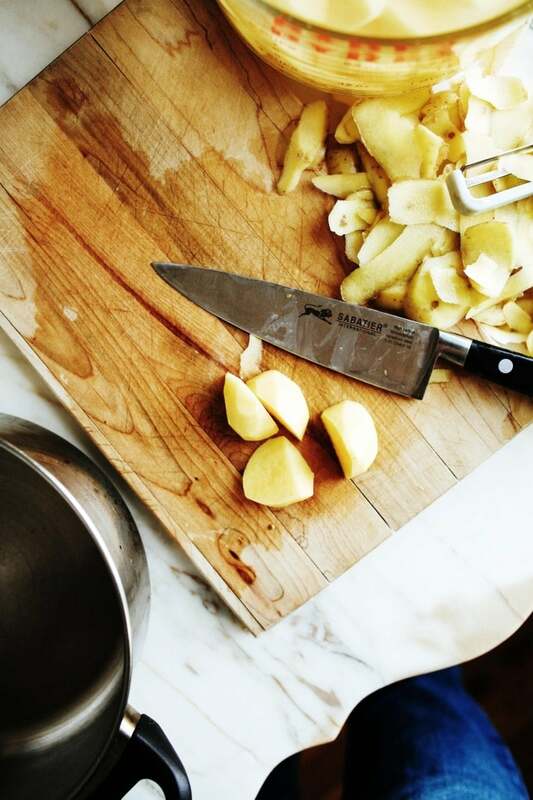 By carefully sourcing the best ingredients, kitchen tools, serveware, and local artisan foods, Hamptons Lane helps chefs everywhere expand their culinary horizons – all for a great price. Visit the Hamptons Lane website for more information. Kam, you crack me up. Only you could compare hot people on the subway to beautiful roast potatoes and do it so well! I’ve never used duck fat before, but I’ll look for it and try it out. Do you think chicken fat has the same outcome? Hi Deidra- Hahaha, thank you! I can’t help it lately. Chicken fat would definitely work just as well here. I think kids and most adults who aren’t accustomed to the flavor of duck fat (like my mom and best friend!) might actually prefer the flavor of chicken fat, so go with that if you have some schmaltz on hand! So pleased youre back and blogging!! To say I love your book is an understatement – the hardest thing is to pick out which are my favourites! I’m thinking he Autumn Harvest Apple Loaf is probably my default cake now – made it half a dozen times & keep going back to it. There’s always apples in the fruit bowl that need using – and the cake is so simple to make – yet turns out to be so complex in flavour and texture – love it! Now I’ve discovered you and your blog – please, please, please keep writing! You are ridiculously talented at what you do and have the gift to both delight and inspire… more power to you! Gosh, your message made my day. Thank you so much! 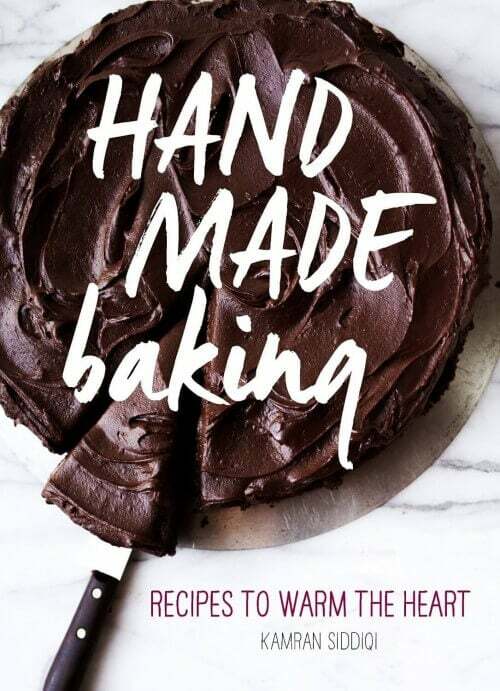 I’ve three recipes lined up at the moment, so you’ll be getting quite a few more posts from me this week and next. Cheers! I just checked his post out– his is fantastic, though his post is quite different from this one ;) He’s using a similar method to the one I’ve seen from America’s Test Kitchen a long while back; baking soda is in the water the potatoes are boiled in… The technique I use here is quite basic and a bit different than Kenji’s (though I’m sure his is utterly delicious, as well). Do you think Potato flour would work in place of the regular flour? Hi Laurence- Potato starch would definitely work. In fact it would make an even crispier potato! I just finished cooking dinner and I’m already hungry again because of your post!!! I love potatoes in any form but I really truly love them when they’re crunchy on the outside and fluffy on the inside. I actually have a bunch of leftover turkey fat from thanksgiving… I have a problem with waste lol. I’m going to try your recipe this weekend. Thank you! Naomi- This is a judgement free zone– turkey fat for this sounds absolutely phenomenal. Do let me know how it goes for you! Kam I just saw your newsletter and I came running! These are beautiful. Only you can make such a basic thing look so good. Keep on with more posts please! These look INCREDIBLE. Crispy potatoes really take on the “can’t stop eating” flavor. 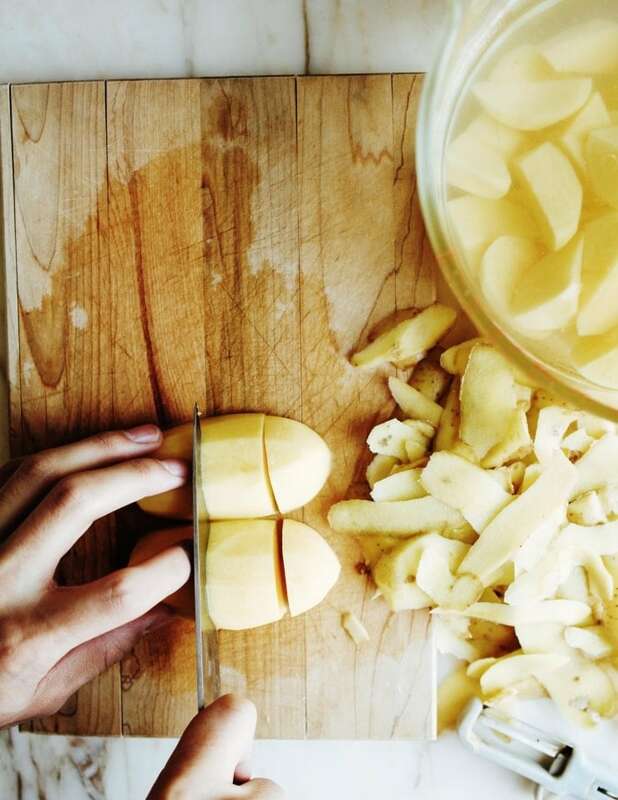 Much more so than any other potato preparation. Thanks for sharing!